for most recent rates and total price. THIS IS A 3 BEDROOM..ALTHOUGH MY RESERVATIONS PERSONNEL SAYS IT IS ONLY A 2 BEDROOM. THE PHOTOS ARE ACTUAL. This SPACIOUS, Platinum Level, 1131 square feet, well-maintained condo has everything you need for the PERFECT family vacation. You won't be disappointed (if you are like many of my prior guests..see reviews)!! We are committed to making your vacation one of happy and relaxing family memories. The extras we provide in our condo are extras which are family friendly with YOU and YOUR family in mind. We are seasoned worldwide travelers and know what makes the PERFECT family vacation. Relax & Enjoy!! This condo is unique from others with same floor plan as it has a door for privacy on the bunkroom..not an opening from the hallway, but a door which can be closed so the bunk room has the same privacy as the other bedrooms! I also just added an additional sleeper sofa in the living room as well as a brand new recliner in 2017. The RESORT also has an on-site movie theatre, Roman Spa--2 Jacuzzi's overlooking the ocean, Workout Facility, Indoor Pool, 2 Outdoor Pools, 2 Outdoor Jacuzzi's, on-site restaurant, on-site sundries store, on-site TIKI bar and on-site rentals of jet skis, beach chair set-up, banana boat and parasailing. I provide the beach chair set up to my guests for free. Email any questions you have. I will be back in touch via email ASAP!!! Family of 5..extended family of MANY! We LOVE LOVE LOVE the beach and have traveled the world..before kids! After kids, we knew the gulf coast sugar-like sand and convenience of Tidewater was the PERFECT place to make our family memories! The beach..the sand..the water..the sun..the fishing off the pier..the shopping at Pier Park..exercising..roman spa..movie theatre on-site! !..nearby dining..we love it ALL! Living Room/Kitchen/Dining view is of the ocean/beach! Nothing to obstruct your view! Benefit of being directly ON the beach! Located directly on the beach. PERFECT height for watching the ocean, watching the beach..the sundeck..Not too high, Not to Low... Quiet level--you'll hear only the ocean!! Nothing to obstruct your view. Beach front, on the ocean, no roads to cross. Bath towels, hand towels, wash cloths, dish towels. We ask that these items NOT go to the beach. Please bring your own beach towels. One of the best work out facilities in PCB! Maintained by owner throughout the year. 5 chairs for round dining table. Additional 3 chairs at counter. Seats 8 for dining. We provide some movies..and hope you enjoy! Private Balcony for watching the dolphins, dining, enjoying the sunset. Shared sauna in common area. Three Swimming Pools, PLUS a Kiddie Pool. One pool is beachside, another is a heated indoor with a swimthrough to the second outdoor pool..also heated! 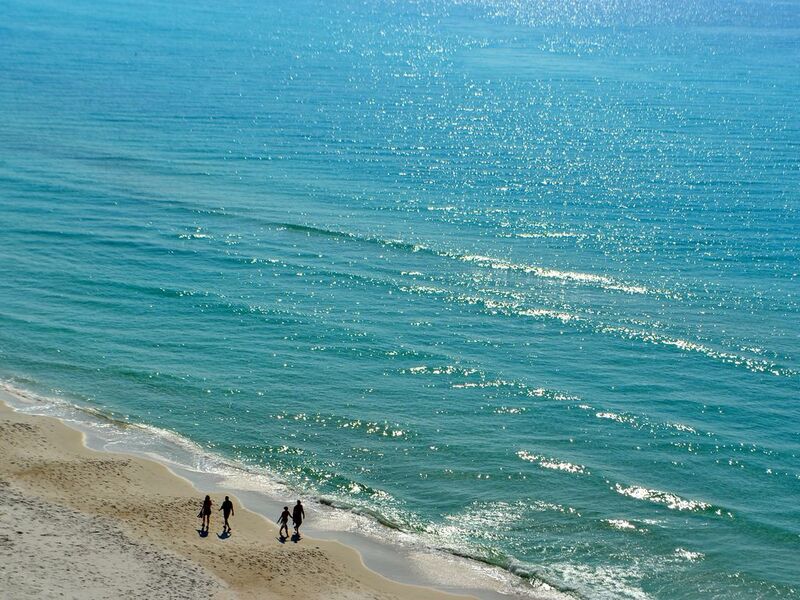 EVERYTHING you need for the PERFECT Vacation one of the Best Beaches in the US!! Making Memories! Relax and Enjoy!! Although we did enjoy our stay, peak times during the mornings and afternoons made the elevators extremely slow. Be prepared to wait, or just take the stairs if you're on a lower floor. Well well..David H. -- I told my husband I expected a negative review from you after spending way too much of my time with you in communication trying to coordinate an additional night for you. Because YOU decided at the LAST MINUTE you needed to check in a day earlier. Shame on you. Just because you decided at the last minute you wanted to check in a day earlier and I would not give it to you for free.. does not warrant a 3 star review. Prospective guests, please read other reviews about my condo. David complains about the elevator wait time. David was there for kids baseball tourney--and he and another family stayed in my condo. I expect it was a busy week with the baseball games. I've been told the elevator wait time was not unreasonable. David did not contact me during his stay to complain..but instead surprised me with his 3 star review. I know it is not warranted. Unfortunately, I can't rate him at this point as too much time has passed. David H. - please find another condo next time. Thank you. Location and resort was great. Loved having beach chairs included in our stay. The staff was very friendly and accommodating. The resort had everything that we needed. Would highly recommend this resort. This condo was great! We had 5 adults on the trip. Having 3 bathrooms was great and certainly helped when getting ready to leave for dinner. The condo is fully furnished. We only made breakfast in the condo and made sandwiches for lunch so we did not prepare full meals but the pantry was stocked with pots and pans. We did have to buy salt and pepper so if you plan to cook your meals, you'll need all ingredients including spices. The unit has one tub/shower in the master bedroom. The other two bathrooms have showers only. The unit was stocked with paper towels and toilet paper. We stayed 5 nights and were out of paper products by the last day. Bring an extra roll or two if you are staying for a week. There are plenty of extra beach chairs in the room and easy to take to the beach. The condo is located close to many restaurants and shopping. There is a Walmart and Target close by as well as s Winn Dixie and CVS. We drove so we had transportation to anywhere we needed to go but there were things to do in walking distance. The beach is beautiful. There were two nice pools though my group never used them. We stayed on the beach. This is a very large resort with many amenities. As such, there can be a long wait for the elevators. But there are elevators on each end of the building and off of the lobby. I would definitely stay in Karen's unit again! Condo was very clean and perfect for our family spring break! Check in was very quick and easy. We had plenty of room for 4 adults and 3 kids. The ocean was crystal clear and beautiful. We will definitely be back. Thank you for your review! Please let us know what we need to do to earn 5 stars! We hope you will come back! Great place to stay. Very easy process to book and access unit. Location was great as was the condo. Had everything you needed. A plus was the beach chairs and equipment they had available. Would definitely stay there again! Thank you so much for your 5 star review! I was praying the hurricane would not impact PCB! So glad you all were able to enjoy your "much needed" beach vacay! You are welcome back anytime! Our 2nd visit to Tidewater and really enjoyed our stay here. The elevators were pretty quick this visit but I believe the condo is not quite as booked this time of the summer. The condo was nice and we enjoyed having a 3rd BR/BH for my son's friend that came with us. Karen was very quick to respond to all my questions. Thank you for a very enjoyable stay! So happy you enjoyed your stay!! Thank you for your comments and your review! I am glad to hear you didn't encounter elevator issues. You and yours were awesome guests and are welcome back anytime! We welcome softball teams, baseball teams, golf teams and any other GROUP visiting to play in the area! We love supporting teams!! and FAMILIES! YOU MUST CALL MY RESERVATIONS NUMBER TO BOOK MY CONDO. CALL 888-475-9051 AND GIVE THEM MY OWNER CODE TDW50.. THEN ASK about any SPECIALS! I offer specials when I can!